Discussions Magazine Music Blog: SPAZ reviews SUZI QUATRO's 4CD anthology THE GIRL FROM DETROIT CITY! SPAZ reviews SUZI QUATRO's 4CD anthology THE GIRL FROM DETROIT CITY! Suzi Quatro is much more than the sum of her musical parts. To most folks here in the U.S. of A., she is best known for playing Leather Tuscadero on Happy Days and for the massive hit single “Stumblin’ In,” a duet with Chris Norman (of the band Smokie, who barely registered on the radar here in the states). Unfortunately, there are those that think she faded from view in the late ‘70s, never to be heard from again. Well, I’m here to tell you that that is the furthest thing from the truth. Suzi was not only rocking a decade before she showed up on Happy Days, she’s been kicking up a storm since her final appearance on the show 35 years ago! With the release of the 4CD anthology The Girl From Detroit City, you now have an opportunity to take a a trip through her career and to listen to what you’ve been missing all of these years! For those of you who are already familiar with Suzi’s 50 years in music, you will find rarities and great packaging filled with information, insight, archive photos, single/LP sleeves and more. More than just a selection of ‘hits’, The Girl From Detroit City is a stroll through a five decade old career that has often surprised but never disappointed her massive fanbase. From her ‘60s recordings with The Pleasure Seekers (“Light Of Love” is especially wonderful) up through her fab new single, “The Girl From Detroit City” (one of my personal favorite Suzi songs ever! ), this is a collection that reminds the listener of just how versatile she has been throughout her career. From the Glam stomp of her early ‘70s singles, the unexpected excursion into Funk, her glowing performance in Annie Get Your Gun, and her shimmering slices of AOR/Melodic Rock, this is an artist never afraid to try something new and always making it sound so easy. Tracks like “Can The Can,” “Devil Gate Drive,” “48 Crash,” and “Daytona Demon” may have kick-started her ride into Rock’s history books, it is the lesser known tracks that prove she never lost a beat even when swimming against – but occasionally with – the stream. “Heart Of Stone,” “I’ll Walk Through The Fire With You,” “Main Attraction,” “Lipstick”, “American Lady,” “If You Can’t Give Me Love,” “Mama’s Boy,” and a cover of Abba’s “Does Your Mother Know” with Sweet’s Andy Scott are just the tip of the Quatro iceberg. And we can’t forget the brilliant “Stumblin’ In.” It was her biggest hit here in the U.S. and still sounds utterly fantastic. And, again, the autobiographical title track, written for this set by long-time collaborator Mike Chapman, is not only one of her finest moments, but also one of the best singles of 2014. Time to plop your money down on the counter and demand The Girl From Detroit City as soon as possible. 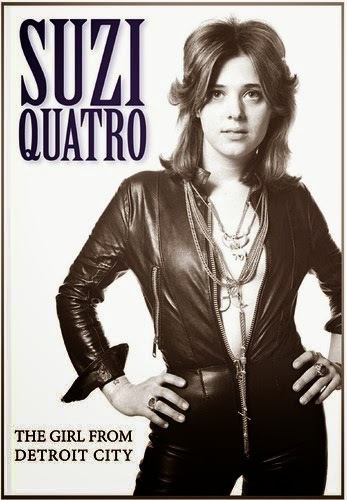 But let this serve as a gateway into the world of Suzi Quatro… then start buying each of her original releases because there’s so much more to love! P.S. There are loads of rarities here, too - in fact, Disc Four is made up entirely of them - so even fans are going to find much to love on this set! For more info on Suzi, please read my interview HERE.